After Kochadaiiyaan, A.R.Rahman is back with a period film, Kaaviyathalaivan to enthral his fans. Today a press meet was held by the Kaaviyathalaivan team after the audio launch. The event was a gala affair with many top personalities participating such as A.R.Rahman, Vasantha Balan, Siddharth, Vedhika, Nassar, Anaika and the technicians, producers of the movie. Nassar was the host for the show. He started off explaining about the importance of stage plays during early 1930’s in Madurai. He said that there are two types of directors; one who makes a formula and sticks to it and another who wants to explore various genres of movie making and that Vasantha Balan belongs to the second category. Nassar also talked about his recent visit to London where he happened to watch few stage shows and also emphasized on the fact that even today, stage show is an integral part of people’s life in Western countries. He concluded by saying that this movie is an honest effort from Vasantha Balan to bring stage shows back in India. Then five drama artistes were honoured with a sum of 25,000 rupees each for their love and passion for the art. Three songs from the movie were screened namely ‘Vaanga Makka Vaanga’, ‘Aye Mr.Minor’ and ‘Sandi Kuthirai’, the visuals were a treat to watch and got huge applause from the audience. Varun Manian of Radiance Media spoke about the effort Sashikanth, the other producer of the film took to shape the film so well and also praised A.R.Rahman for giving such wonderful tunes and that his presence has taken the film to a different level. He also asked the media to extend their support for the movie. Sashikanth spoke about his reunion with Radiance Media after ‘Vaayai Moodi Pesavum’ and his urge to produce different movies that would push the industry further, by saying “think big dream bigger”. He also spoke about the ups and downs he had to go through while making the film but since the film is finally over he is so excited about the final product. The producer also thanked cinematographer Nirav Shah, A.R.Rahman, Siddharth and Prithviraj. Shweta Mohan talked about how a man produce such lovely music and still continue to make fresh tunes like this. She also said that she felt blessed to sing a song in Rahman’s music. This is what singer Haricharan had to say about the film. 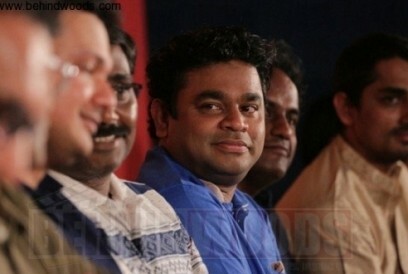 ‘Every singer has a dream to sing one song for Rahman sir. I have got a rare chance to sing four songs in one film’. The National award winning editor spoke about his experience working on the movie and also said it was so challenging to cut scenes since the performances of all the actors were so brilliant. He opened up saying that this film will be a different experience for the movie goers. He also said that working with contemporary stories limits the scope of a writer while a historic movie gives a writer scope to show his creativity. Pa Vijay remembered Valee and said ‘Yarumila’ song is dedicated to him. He thanked Rahman for choosing him and also said that he has written 3000 songs but very few songs like ‘Sollividu Sollividu’ will be remembered even after 100 years. Thanked Vasantha Balan and said Siddharth was a wonderful co-star. She also said that dancing for Rahman’s tunes was unbelievable. She said that though she plays a role called Vadivambal, she will be portraying 20 different characters in the movie. She also talked about how blessed she was, to work in a film that has 7 National award winners. ”It is a movie about stage shows and actors associated with stage shows. Vasantha balan will take you to a different world with KT and A.R.Rahman is the pull factor for the movie”. Sid also wished to dedicate the movie to Valee and choreographer Raghuram since this movie happens to be the last for both these legends. Vasantha Balan added an element of sentiment by asking the guests to stand for a minute in remembrance of Valee and Raghuram. Vasantha Balan then said that any director who intends to make a period film based on stage plays will immediately be reminded of S.P.Kittappa and K.P.Sundarambal’s love story and the seven love letters that were exchanged between them, but he wanted to make a holistic movie that emphasized on stage plays rather than a love story. He also thanked Writer Jeyamohan for bringing in life to the movie. Rahman thanked Vasantha Balan for giving this opportunity, and then he talked about his meeting with Majid Majidi during which the Iranian director asked him as to why Bollywood is not embracing Indian culture in their films. Rahman said that he will not only show this film to the Iranian director but also expects him to like the film. Sigaram Thodu- Star studded audio launch ! Nasser goes fully responsible ! This page has information about Kaaviyathalaivan press meet - event story.